I absolutely love to bake - when I'm in the mood. You see, baking is a commitment. A commitment of your time, a commitment to cleaning up the mess when you're done, and a serious commitment to keeping your little one away from the oven. Last year, to satisfy my need for pumpkin in a cost effective way, my little one and I made two ingredient pumpkin muffins. Of course, he was 6 months old at the time, so I pretty much just baby-wore and mixed. Those were the days... This year, since I offered to host my family for dinner, I decided to put in a little more effort. 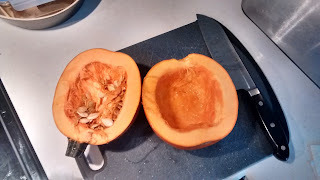 I love to roast squash for a delicious fall dinner, so I thought, making my own pumpkin purée couldn't be that hard. I'll tell you, I was right. There were a lot of steps, but the results were fantastic! 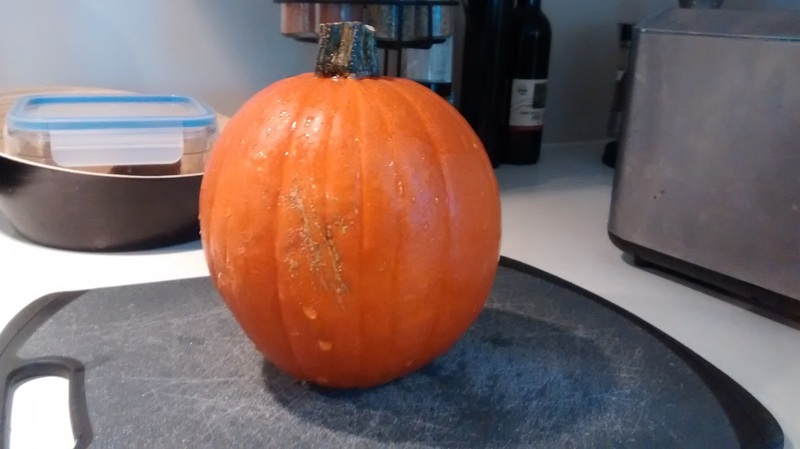 I began roasting my pumpkin before I even had a recipe in mind. Risky, but I figured I knew what I was doing, and could use the 45 minutes to scour Pinterest for the rest of the process. I halved one sweet pie pumpkin, cleaned the inside, and placed them face down on a foil lined cookie sheet in the oven at 425F. 20 minutes in, I carefully turned the pumpkin halves on to their backs to finish the process. They turned out beautiful, and I let them cool a long time before handling them. While the pumpkin cooled, I cleaned the pumpkin seeds I had harvested, drizzled them with a little olive oil and salt, then roasted them for about 12 minutes at the same heat. You have to watch them so that they don't over cook. Man, were they delicious. 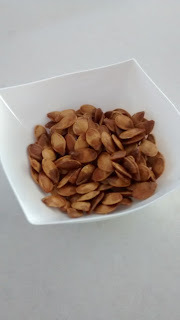 My family almost missed out on this side treat because I snacked on them all day as I cooked. 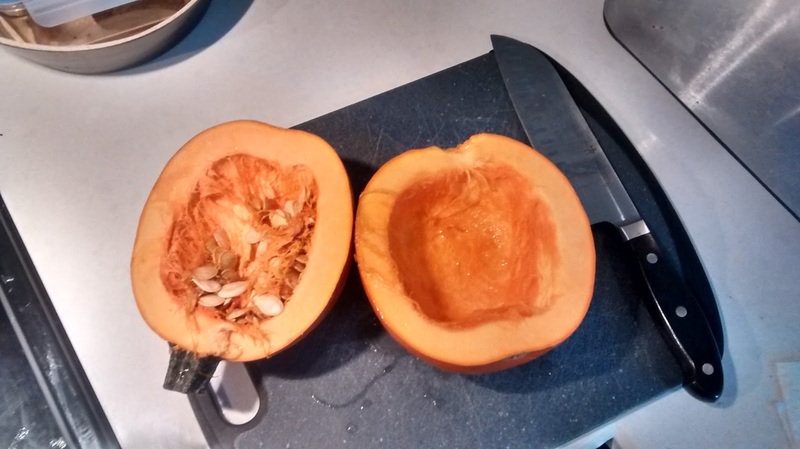 Once it has rested enough to peel, it separated so evenly, I was surprised. The flesh already smelled great, so I knew it was going to turn out really well. I mashed it lightly with a pastry cutting tool, then I followed the instructions for making the purée into filling. I didn't have time (read: didn't want to bother) making my own crust, so instead I opted for frozen tart shells. They were really easy to use and are a good thing to keep on hand. The shell itself is unsweetened, so they could easily enough be turned in to quiche or pot pie shells for an easy mid-week meal. I will definitely look for these on sale again. The recipe I ended up using was this one for Pumpkin Pie. It's pretty thorough, and I followed it relatively well... I have a bad habit of mixing things together before reading the order of operations - a dangerous game in the chemistry of baking - but it seemed to come together well and it was smelling fantastic. 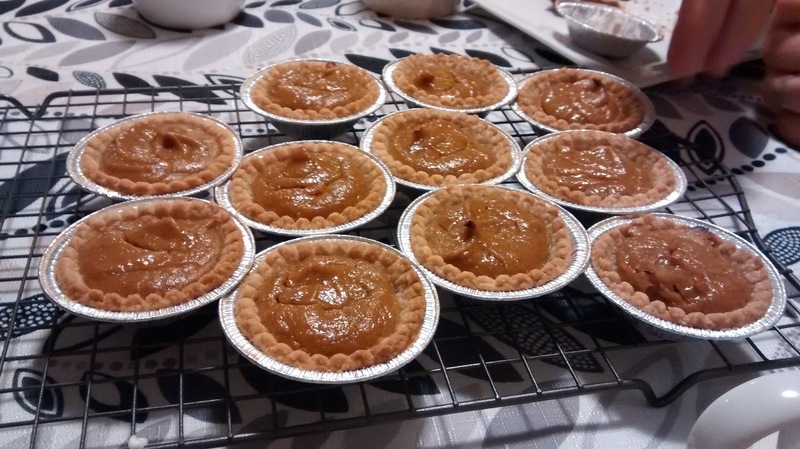 I poured it into the pre-baked tart shells, and cut the cooking time for a pie in half. They were set perfectly, and I let them cool on a wire rack while we ate dinner. They came out looking amazing! I was really proud of myself. We whipped up some fresh whipped cream to serve on top, and I was thrilled with the results! I'm not sure I could taste a huge difference from canned, but they did taste incredibly fresh and delicious. It was a little more work than canned, sure, and took a little pre-planning. With the oven going all day, it didn't bother me in the slightest. Plus, it was only $1.25 for my pumpkin and the cans seem to sell for around $3 - not to mention they are oft sold out at this time of year! I declare it a baking victory! How did your Thanksgiving meal go? Any successes? Major failures?